The background to how this Freedom of Information Act (FOIA) request played out is the most interesting part of this. It started with seeing reference to the document in a bibliography about Air Force Plant 67, or the Georgia Nuclear Aircraft Laboratory. I was informed that the document was controlled by NASA, and I should contact them to obtain it. So, in September of 2016, I did just that… never knowing how it would all play out. Now, on to the document. systems can be designed, these effects on the properties of materials must be known. 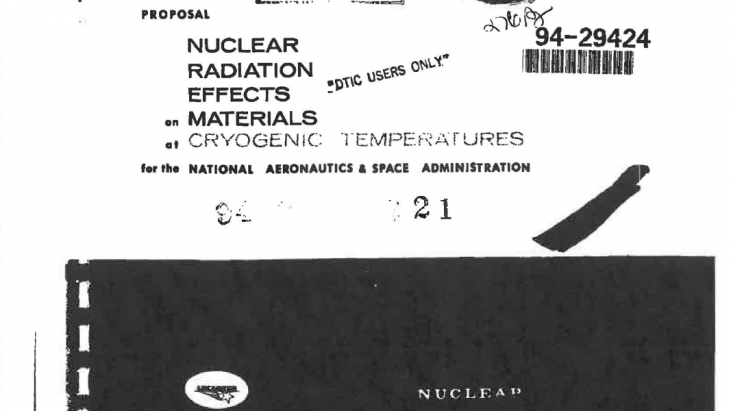 To meet this requirement, Lockheed Nuclear Products outlines in this proposal to NASA a program for a study of the combined effects of nuclear radiation and cryogenic temperatures on the engineering properties of pertinent materials that may be used in the construction of nuclear missiles. This proposal includes an analysis of the state-of-the-art relative to the effects of cryogenic temperatures, nuclear radiation, and low-temperature annealing on the engineering properties of materials. The rationale for choosing the temperatures, integrated radiation doses, radiation under stressed and unstressed conditions, materials, and specific tests to be used in the test program is presented. resumes of the personnel available for the project, the project organization, and facilities available to the project. Furthermore, a schedule for the entire program is presented.